Mamma Mia! hits Julie’s sweet spot. 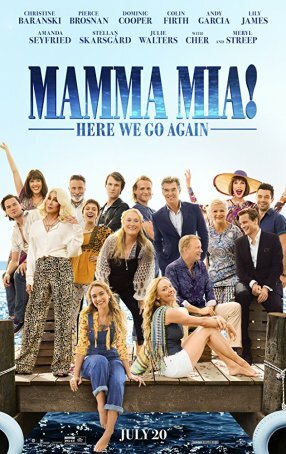 Just ten years later, the gods decided to grace us Mamma Mia fans with another movie to sing and dance along to while in the car or shower. My thoughts: It is so hard to put my thoughts into words. I laughed, I cried, and I sang constantly. Let me just say off the bat, if I have time to see this movie one more time, I will definitely do so. Immediately after the movie ended, I jumped into my car and searched for the soundtrack on my Spotify. The entire ride home, I jammed to the playlist and I plan to on my every day commute. From what I have seen, most sequels of movies tend to ruin the power of the original, but I promise you, this movie did no such thing. The love, the music, and the sense of togetherness made my heart so happy. Julie’s Advice: Need I say more… PLEASE SEE THIS MOVIE!!! SO AMAZING. If you are looking for a fun, inspiring, and heartfelt movie, check out Mamma Mia! Here We Go Again in a theatre near you!